Chronologically speaking, this is the first story in the Dimwood Forest Chronicles. However, it was written after Poppy and Poppy & Rye, and I feel like publishers are doing a disservice to readers by placing it at the front of the series. 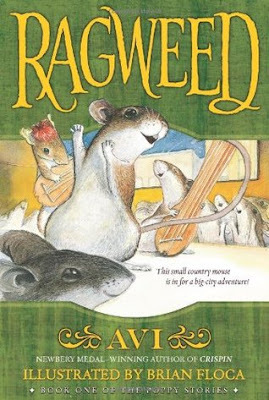 As you might remember from my review of Poppy, Ragweed (a young golden mouse) is Poppy's boyfriend, and, quite unfortunately, meets his end at the talons of Mr. Ocax in the first chapter. It was sad and a little shocking, but it didn't traumatize any of us because we had spent so little time with Ragweed. The only things we really knew about him were that he was brave, cocky, and independent. However, we would not have been so nonchalant about his death if we'd read this book first. No way. It would have broken our hearts (and it still hurts a little, even knowing the end from the beginning). In this story, we came to know, love, and respect Ragweed. When the story begins, he is not the self-assured mouse we find at the beginning of Poppy. He is curious and wants to strike out on his own, but when he finds himself in Amperville, he's like a fish out of water. He's used to the forest, and he doesn't know the first thing about finding food or staying safe. Luckily, he meets Clutch, a sassy, street-smart mouse, right at the beginning, and she gives him a crash course in city living. Their main concern is Silversides, a cat with a grudge, and Graybar, her low-down accomplice. Silversides believes that Amperville's downfall is due to all the mice overrunning it, and she wants nothing more than to drive them out. She nearly succeeds, but by that time, Ragweed is getting the hang of the city and organizes a grand plan to take a stand against the cats and save the city for the mice. Not all books are fun to read aloud (The Family Under the Bridge was one, I admit, that about did me in), but Ragweed was pure pleasure. The city slang was just so fun to say. Try a few of these yourself: "Awesome. You are the whole thing plus chips." "Hey, like, he just blew into town." "It takes, like, one wicked mind to think of nothing, don't you think?" I never even knew I wanted to talk like a punk, but those were my favorite parts of the book to read, for sure. And it was catching. Every time we finished reading, Maxwell couldn't help talking like Clutch: "Like, I have to go brush my teeth, know what I'm saying?" It would have been annoying if it had gone on for a long time, but since it didn't, it was pretty endearing. But now, let me return to my original complaint: If we had started the series with this book, as the publishers want you to do, we would have been devastated by the opening scene of Poppy. But I'm not pushing for Ragweed to be read after Poppy just so that your heart won't break in two. No, I think it's important to read them in the order Avi wrote them because that's how he conceived of the story. When he wrote Poppy, he didn't know Ragweed very well either. And, if I might be so bold as to make this claim on which I have absolutely no information to base it, I truly believe that if Avi had written this book first, it would have changed the nature of the rest of the series entirely. First of all, I don't think Ragweed would have died. And second, I think it's very possible that Avi might have based the whole series on Ragweed instead of Poppy. That's because Ragweed's story is just too good. And Ragweed is just too awesome of a character. Avi would have wanted to do more with him. Don't get me wrong. I love Poppy and Rye and Ereth and all the other characters that fill Poppy's stories. I'm happy to read an entire series about her. But Ragweed is something special, and so he deserves to get special attention from the reader. One way to do that is by coming back to his story rather than starting with it. Just try it. You won't regret it. Not familiar with any books but went and checked them out. Look like our kind of books, and yes can see we'd be devastated to read 'in order'. Yes, I think you'd like them, Erin! Let me know if you end up reading them. And yes, I happen to have VERY strong opinions about the Narnia books being read in publication order, NOT in chronological order. I love The Magician's Nephew coming near the end of the series instead of the beginning. It's much more impactful. I have read "Ragweed"--long time ago, but haven't read it to my kids yet. I agree with you on the reading order. Let "Ragweed" come after so that it's more of getting his backstory, rather than getting to know him and love him before the big chomp. Mr. Ocax is frightening, for sure!